Is it possible to take an image of the firmware of HDD and SSD? I suspect that both my HDD and SSD may be infected. Is it possible to take an image of the firmware? How do I go about doing it? There is a standard to write firmware, the ATA DOWNLOAD_MICROCODE command and the segmented version (transfer protocol 3), but there is no standard for reading the firmware back. As another answer says, some manufacturers may add their own vendor-specific techniques to do so. There is another reliable way to access firmware, but it cannot be done from software. Opening the drive to see the controller will expose the firmware chip (flash or EEPROM) which can be read directly using specialized hardware designed to interface with the chip, such as a SPI reader. Sometimes, the controller chip has internal flash, meaning there is no external chip to read, which would mean attaching a JTAG probe to the chip is the likely solution to obtaining the firmware. There are two excellent resources showing what it takes to read the firmware so it can be modified and replaced which I know of. Specifically, an incomplete (?) write-up on HDD firmware-based MBR rootkits from Malwaretech and the classic Linux port to an HDD by SpritesMods. An image from the latter showing the flash chip which you'd need to directly interface with to read is below. There aren't tools readily available to read/dump a SSD firmware (except for a few specific cases). Each manufacturer implements their hardware and firmware however they want. This means there's no standard protocol to dump a SSD firmware. The only way we get a tool to dump a specific vendors firmware is if they release it, or someone reverse engineers one. 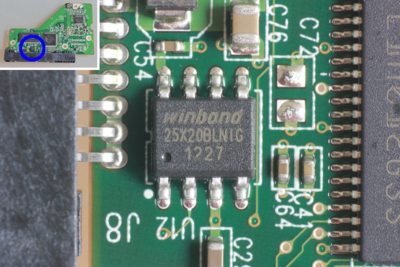 Reverse engineering a firmware dumper can be difficult, and doesn't necessarily apply to all drives from a manufacturer since they could change chipsets, or protocols for firmware interaction on new models at any time. Not the answer you're looking for? Browse other questions tagged firmware ssd disk-image or ask your own question. How can the Equation Group HDD firmware malware help bypass FDE? Is it preferable to wipe device first and then upgrade firmware, or vice versa? Who and how can update cable modem firmware? Is it possible for the firmware of an SSD be infected by malware/malicious rootkits via the internet? Does full disk encryption offer mitigation in the case of the firmware of an SSD being compromised?